Chief Wayne James, of Indiana University Police Department – Northwest (IUPD-NW), will be honored later this fall as one of the International Association of Chiefs of Police (IACP) 40 Under 40 Award recipients. The award, given this year to law enforcement officers from the U.S. and nine other countries, recognizes notable leadership skills and a commitment to the law enforcement profession. "Chosen from a very competitive field of applicants by review panels composed of law enforcement executives, previous awardees, and international representatives, these individuals embody the qualities inherent in excellent law enforcement personnel and leaders," stated the IACP when announcing the award recipients. James has also served as the IU Police Department's first Chief Diversity Officer for almost a year, developing relationships on all of IU's campuses similar to those he has developed at IU Northwest and in the city of Gary, where he was raised. James emphasizes community engagement, where he and his officers interact with neighbors of all ages in a variety of ways, including basketball games, an ice cream truck, shoveling snow, and a neighborhood clean-up. Officers also look for opportunities to regularly engage with students, faculty and staff. James has been successful at recruiting police officers who reflect the diversity of the IU Northwest campus, with specific focus on increasing the number of female officers. There are currently four female officers in a staff of 22--a high statistic in the male-dominated law enforcement profession. James says he intentionally works to diversify his force and continues to work with colleagues at IUPD locations across the state to increase diversity throughout the department. 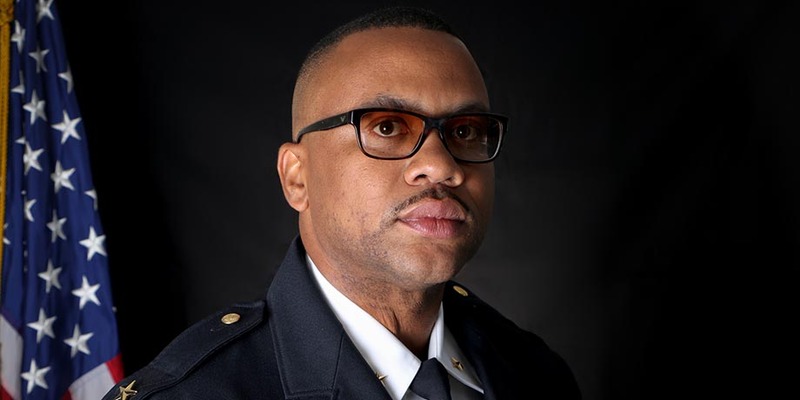 "He has embraced this Chief Diversity Officer role with a sense of pride and professionalism," Benjamin Hunter, superintendent of public safety at IU and interim associate vice president of Public Safety and Institutional Assurance, said when nominating James for the award. "Wayne has met with countless students highlighting our commitment to procedural justice and fair and impartial policing, topics that will be taught to recruits in the IU Police Academy with James's assistance." Hunter also noted James's role leading the work of the De-escalation and Training Commission, which brought together police officers, faculty, staff, and students to look at IUPD's policies, training, and equipment related to incidents where police encounter resistance or are required to use force. James's reputation as a "progressive, intelligent and thoughtful leader," is well deserved, Hunter said. "His background is not unique in law enforcement, but his commitment to servant leadership is second to none," Hunter said. James will be honored with the other award recipients during the IACP annual meeting in Orlando in October.